Congratulations to the crew of Ritalin on winning Olson 30 NA's. Slow roasted pork Ribs glazed with a Whiskey BBQ Sauce. Greek salad with house made red wine vinaigrette. Crudite tray with house-made ranch dip. A variety of sweet treats. $20 for adults and $10 for kids, see you tonight! There is only a litte of Muskoka Brewery's Summer Weiss left, try a pint before its gone! Up next are two new beers from Broadhead Brewing in Ottawa, their Darkhorse Stout, which is replacing the Wind & Sail Dark Ale and our next feature beer, their Wildcard Pale Ale. Come in and try a pint and as always let us know what you think! Saturday, August 29th at Jemmet's landing, KYC will be hosting our long-awaited summer wine-dinner. Chef Neil will be creating a delicious menu of local food to be paired with some of the best wines Ontario has to offer. There are only 20 seats for this exclusive event, sign up with James at bar@kingstonyachtclub.ca today, to avoid disappointment! The 2015 Olson 30 NAs in conjuncture with LYRA was hosted by the beautiful Sodus Bay Yacht Club. Six boats registered for Thursday's long distance course, which opened the event. It was a windy day with big shifts that lead to a commanding victory and presentation of the long distance trophy to Victrix (aka Surfer Girl from Quebec CIty), followed by High Anxiety (from GYC in Rochester), Ritalin (from KYC in Kingston), and Chicane (the home-town-hero from SBYC). The long distance race was not eligible for a low score throw out, so it set the strategic stage of the following races. Course racing followed Friday through Sunday on Charlie course which presented almost every condition possible on the open waters of Lake Ontario: 25kts and 6ft waves to 0kts and flat calm, a brief line squall, and one 90 degree hard shift. The Olson 30s observed thrilling starts with all boats getting off the line in tight quarters. The fleet battled early for control of the favoured side and race winner was generally the one who gained control early. Atop the overall podium observed Ritalin bringing the George Olson Memorial trophy back to Canada after High Anxiety's (USA) win last year; Victrix took red flags and High Anxiety took blue flags. I experienced my first broach while helming Ritalin/any boat; a daunting moment when you realize that you are NOT in control anymore. It was Saturday, the fourth race (2 of 3 that day) on the last downwind led, the windiest day with breeze above 20kts and big waves, all boats were rigged with jibs and only Ritalin reefing the main. We rounded the windward mark with a comfortable lead over Victrix: "Pole-on, but hold the hoist until we see a kite behind us..." [pause as Victrix rounds] "...damn, she's hoisting, kite up!" We were close to finishing when the boat started to speed-wobble in the waves. I tired to keep the mast under the boat with hard tiller corrections, but things were oscillating exponentially: "I'm loosing it!" [bang; the boat rounds to leeward hard, tips, and the spreaders hit the water; the boom swings from vertical down towards the water, the boat sits oddly calm on her side almost as if waiting for us take a moment to reflect, then slowly turns back downwind and rights itself. Once we get the kite down and boat under control, I look back over my shoulder to see Victrix surfing towards us at twice our speed, my heart sunk... then out of shear luck?karma? ?Neptune's grace??? - Victrix' kite snap shackle breaks open and the kite falls gracefully into the boat. We finish wing-on-wing a few boat length ahead of Victirx. The delivery home saw heavy cloud cover and cells on the radar forecast, we set off at 7am back to Kingston. Starting at 25kts wind swinging 5 degrees every 10mins from NNW to SW, we plowed down waves on reefed main only bearing 20 degrees aiming to take Main Duck, Pigeon, and Simcoe Islands to starboard. The wind dropped to 15kts while the next storm front sucked up power; we shook the reef and hoisted the jib and sat anxiously for the rain to hit. Pitter-patter, then full on low-visibility down-pour. Wind back up to 20kts, we felt comfortable with full main and jib. Max boat speed was 13.3kts!!! The end numbers were 10hrs dock-to-dock, avg 6.3kts boat speed, 1 round of coffee, and 2 rounds of hot cup-a-soup. I hope our fellow racers made it home safely. In general a truly wonderful regatta that will be hard to forget. Can't wait to defend the trophy next year. The Wolfe Island race is this Saturday. This annual fixture of the weekend racing series takes boats around Wolfe Island. The Open 60 race boat, O'Canada will be moored at KYC from August 13 - 19. There will be an open house on Saturday, August 15th, which members are invited to and will include a Helly Hansen fashion show. 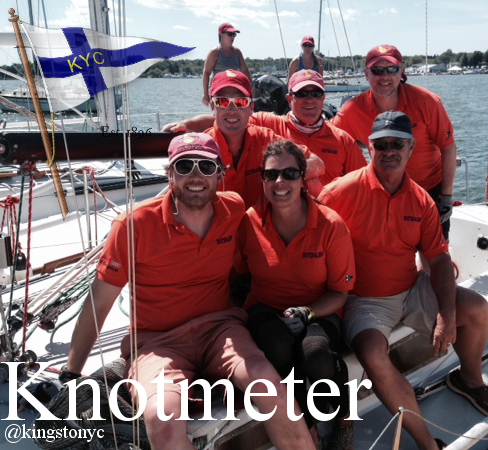 This past weekend KYC hosted the 49er, FX and 29er Canadian Championships. It was the first major event for our skiff teams this season. The three day event brought great thermal wind for each day, with winds starting out at 10 knots and building to the low twenties each day. Leading the charge for the KYC HPT was Cameron Shaw and Henry Lockyer who dominated the three day event. Their worst race over 12 races was a 3rd. They finished with 6 wins, 5 2nds and a single third to easily win the Canadian Championships. by 14 points. In third was former KYC HPT members Sam Thompson and Max Wood who reunited to take a run at the national title. They were tied for second, but lost the tie breaker. Christina Black and Naomi Flanagan were the top female team finishing 4th overall. For the remainder of the team it was for most their first ever 29er regatta. Some big gains were had and they are looking forward to the next event at the Sail Canada Youth Championships. In the 49ers KYC HPT had two boats competing. Both are new into the 49er this spring and were looking to test their spring and early summer training. Leading the charge for KYC was Alex Heinzemann and Mac Morrin who made steady progress throughout the event, finishing 5th overall. Max Flinn and Cameron Sawyer were the other team. Unfortunately they broke their mast on day 2 and missed quite a few races, pushing them back to 8th overall. Our Pan Am representatives Erin Rafuse and Danie Boyd dominated the event easily winning. The remaining KYC FXs showed some good signs they’ll be moving up soon in the fleet. Evan Depaul and Will Jones showed great promise at times, but lacked the finish. They wound up 4th overall. Virgine Corbeil and Simone Larose were the other FX team. They made some good gains and have been steadily improving throughout the season. They finished 5th overall.